Guta Blas (1924-2008) was born in Łódź, Poland. Her father, Noach Blas, owned a textile factory and was able to send Blas and her younger brother, Moshe, to private Jewish schools. By 1940, Blas and her family escaped Łódź, which had been occupied by the Germans in September 1939, and fled to Starachowice-Wierzbnik, Poland, where Blas's mother, Bleema Goldwasser, had relatives. Blas and her parents were forced into the Tartak work camp in Starachowice, where Blas met her fiancé, Leon Weintraub, a fellow inmate. In late 1943, Blas and her family were moved to another camp, Majowka, in preparation for deportation to Auschwitz. Once there, Blas and three hundred other inmates, including her parents, brother, and fiancé, were lined up in front of open graves to be executed. Before the executions could begin, Blas jumped on one of the Nazi guards from behind and attempted to choke him, creating a disturbance that saved all inmates from execution that day. Though Blas was shot in the head by the officer she attacked, the wound was superficial, and she was deported to Auschwitz with her family. At Auschwitz, Blas's father and brother were sent to the Buna work camp. Blas and her mother remained in Auschwitz until they were forced to march to Ravensbruck in January 1945. Her mother died shortly thereafter. Blas was rescued by the Swedish Red Cross and spent the remainder of the war in Sweden. After the war ended, Blas returned to Poland to look for her father and brother and learned that they had both been killed. She also learned that Leon Weintraub, her fiancé, had survived and was in a hospital in Germany. Blas traveled to see him, and they married and stayed in the Bergen-Belsen displaced persons camp before immigrating to the United States in 1947. 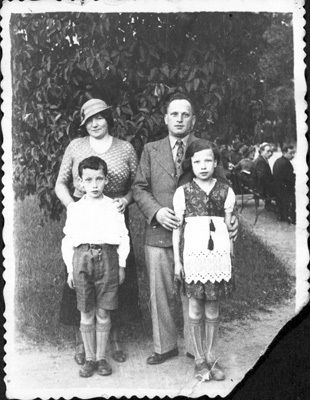 A 1936 photograph of the Blas family taken in a park in Łódź, Poland. In the back, from left to right: Bleema Goldwasser Blas and Noach Blas. Front, left to right: Moshe Blas and Guta Blas.